Valentines Day gifts can be tricky. Flowers are nice, but they are overpriced, wilt, and die in just a few days! Chocolates are sweet, but we are still dieting from the overeating during the holiday season! Don’t fall into the usual Valentines Day trap and resort to these tired gifts. Some of the best Valentines gift ideas are ones that both partners can enjoy. Here is a list of carefully curated, romantic, and maybe even a few “sensual” ideas that are guaranteed to make you a Valentine hero with your partner! A discovery game for married couples ~ You don’t have to be married to enjoy this one! This exciting and competitive game will cure the “we’ve fallen out of love” feeling. Fall in love all over again. Ring the bell for a kiss ~ I love this idea! When either of you hears this bell, drop what you are doing and find your partner immediately for a kiss. 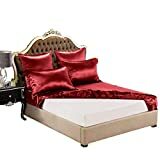 High-End Silk Sheets ~ Your bedroom is your fortress and it should be treated as such. With ⅓ of your life spent sleeping, you should be resting in absolute and sheer comfort. Volcanic Ash Chocolate Facial Mud Mask ~ Start your night with some pampering! Bath Bombs ~ These organic, homemade bath bombs are made with herbs and essential oils. These are great for soaking together after a long day! Ylang Ylang Essential Oil ~ This essential oil can be applied to the skin or diffused. It is known for increasing libidos! Kisses 4 Us ~ This box of fun makes kissing as exciting as it was in the beginning. Are you up for the challenge? The 5 Love Languages Book ~ Every married or engaged couple should read this book. It holds the secrets to long-lasting love! Echo Dot ~ Get your lover an echo dot for the bedroom. Just say “Alexa, play some romantic music” and let the fun begin! Sensual Massage Oil ~ Show each other how much you care by giving alternating massages – while the romantic music is playing!!! I love the discovery game idea. I’m not married, but I’ve been with my better half for 15 years (crazy – I still can’t believe it). And it is so important to keep that passion and kindling alive….and I think this game may be just the thing. The 5 love languages book is a must for my wish list. That and bath bombs. haha.. I would love those. Love these ideas for both my husband and I to enjoy!! So much better than teddy bears or a box of chocolates. Very nice ideas!! I am planning a small surprise for my boyfriend on Valentine’s Day so these are amazing ideas! Oh my god. I love the bell. Valentine’s day is a tricky one in our house. I think we need a night out more than anything else. I love the idea of sheets as a gift! It’s both luxurious and practical. I love everything about Valentines Day. I know its corny but I love spreading a little extra love that day. These are fun and creative ideas for valentines day! Thank you for sharing these. These are great gift ideas. I plan to pick up two copies of the love language book for both my husband and I. After 13 years of marriage I want to gift something that will help our relationship continue to grow stronger. Love this, I’m going to put this to good use! Yup, lots of great ideas here, love it! Such great ideas and a good variety of price points! The 5 Love Languages is one of my favorite books and is perfect not only for a spouse but to understand other family members or friends as well. I’m going to check out the game! Any relationship can use a communication helper, especially a fun one. I love these ideas! I’m the type of woman who would rather have something useful than spend so much on something that’s gone in a second. These are great gift ideas for Valentine’s Day! I love the silk sheets and bath bomb ideas. I would love to receive those for Valentine’s Day. I will send this list to my husband as a hint of what to get me! I love bath bombs. Baths are such a great way to relax with your honey and bath bombs just add the perfect touch. I am going to have to get it together and start making plans for Valentine’s Day. Thanks for the suggestions. I like the idea of choosing Valentine’s Day gifts that both of you can enjoy. It seems much more romantic and thoughtful. These are definitely some great gift ideas! I love the bath bombs. That sounds really romantic. I’m single but who knows that for the next Valentine’s Day all this can not come in handy! Such a sweet gift guide for people in love! Love it!! Perfect gift ideas and fun activities for couples. this Valentine season! PINNEDterest! What a great list of gift ideas for Valentine’s Day that you have came up with. There are a couple that I ;need to pick up as soon as possible. I am all about the romance. Echo Dot is perfext gift for every couple but I think those who like recreational activities would love discovery game too. Wow, what a list of awesome ideas! 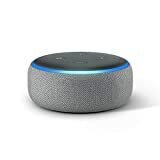 That bath bomb would be a lovely gift for me, and I know that my husband and I would love having an Echo Dot at home. Thank you for sharing this! The essential massage oil sounds romantic! Thanks for the tips. I haven’t really thought about Valentines yet so this was a good read. These are some nice ideas for valentines day, Ring the bell for a kiss would be fun 🙂 I noted down the list. According to me ring, the bell sounds good. The remaining list is awesome. There are some fab gifts ideas on this blog post, a real variety of gifts.. I agree with the lovely bedding too….. Honestly, my daughter would love the mud mask. Although I think I would really like some amazing sheets. I could use some good ones.